A cute studio in San Telmo. This apartment located in San Telmo perfectly suits a couple who comes to know Buenos Aires or one executive who comes to work. Very bright for its white walls and large windows, the apartment has everything you need for a pleasant stay. When you come into the department, is the bathroom with a tub. The apartment has the kitchen on your left. 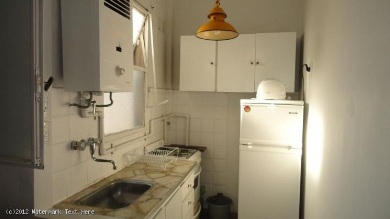 The kitchen is small but it is very well equipped. It has a wide space with a dining table or perform their tasks. And on the other hand is very comfortable with cable TV double bed. It is a simple monkey atmosphere is perfect in its simplicity. Zone: San Telmo neighborhood under is on those interesting places that are discovered while walking, while narrow cobbled streets are crossed, surrounding colonial buildings, many of which function as antique shops and ateliers. The apartment is a few blocks from the square where Dorregon Sunday is the largest antiques fair in Buenos Aires. Customer feedback > Apartment For Rent in San Telmo. More amenities > Apartment For Rent in San Telmo.